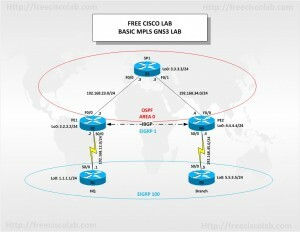 This free GNS3 lab is an effort to provide a better understanding of Multiprotocol Label Switching (MPLS) and how to configure it on Cisco IOS routers. 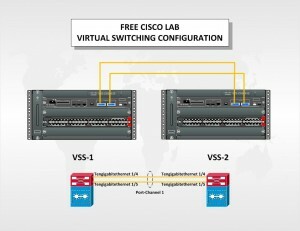 Virtual Switching System (VSS) allows two Cisco Catalyst 6500 or 4500 switches to be connected together so that they appear to the network as a single switch. Other devices in the network will see the VSS configured switches as a single switch, which allows the engineer the ability to create multi chassis Ether-Channels between the VSS pair and other devices while appearing to other protocols like spanning-tree as a single switch. 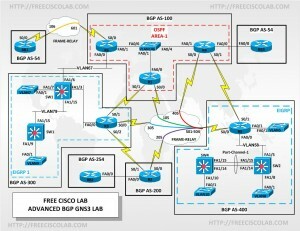 In this free GNS3 Lab you will be configuring EIGRP, OSPF, IBGP and BGP across multiple autonomous systems. You will also configure Point-to-Point and Point-to-Multipoint Frame-Relay. For this lab we are using an old INE topology consists of 9 routers and 4 level 3 switches. 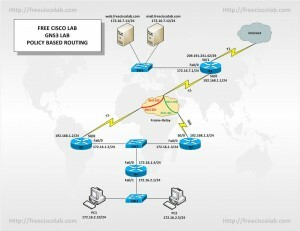 Routers with switching modules install have been substituted for level 3 switches as GNS3 does not support level 3 switches.